Time is going so fast! It is hard to believe that it is the last week in October. After a few sunny days, out weather is back to gray, gloomy, and rainy. At least it is not cold enough for the rain to turn to snow. Once I learned that my health insurance would pay for a gym membership I decided to give Curves a try. I joined a number of years ago so I was familiar with their circuit exercise program. Since the nearest location is less than 2 miles from my home, it seemed like a nice convenient way to both get out of the house most days and do some actual exercise. I have been enjoying the activity and have already gone 4 days this past week. I felt a need to give myself a break from reading new books and bury myself in my favorite comfort book series this week. It has put me behind on my reading calendar but was a nice palate cleanser from reading so many new things. 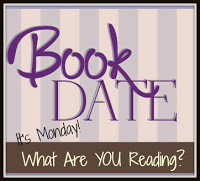 This coming week I'm back to my calendar with a mix of review books and books from TBR mountain. A Vintage Death by Mary Ellen Hughes - review book (Nov. 8); cozy mystery. My review will be posted on Nov. 8. Fatal Festival Days by Jamie M. Blair - review book (Nov. 8); cozy mystery. My review will be posted on Nov. 14. Our weather is back to awful too. Have you checked to see if your gyms or YMCA's offer Silver Sneakers' classes? I enjoy them. Some are cardio and others are low impact. Good book week for you. ENJOY this new week, and stay warm. I used to belong to Curves, and then they moved the gym that was near my house. But I've been thinking about those days when I could get out of the house and get my exercise in, too. Enjoy your books and your gym, and thanks for visiting my blog. I used to belong to Curves and I loved it. Unfortunately they closed down here and there's nothing like it in my area. Have a great week! OOh nice! The cover for Bitten looks cool! Funny that it has a male on the cover whereas Kelley's Bitten was more about a female werewolf! Lol. Hope you enjoy your reads for the week! It is hard to believe we are only 2 months away from the New Year. Watcher in the Woods is on my Kindle too! How many times have you read The Others series? Sounds like me and Outlander. It’s going to snow again this week, and I’m not happy. That’s awesome that your insurance pays for a gym. Mine barely pays for doctors. Have a good week! Watcher in the Woods is one I can't wait to get to. How I Became a Spy looks fun. Thanks for visiting Girl Who Reads. Oh that's nice that they're so close and you're enjoying your new membership.